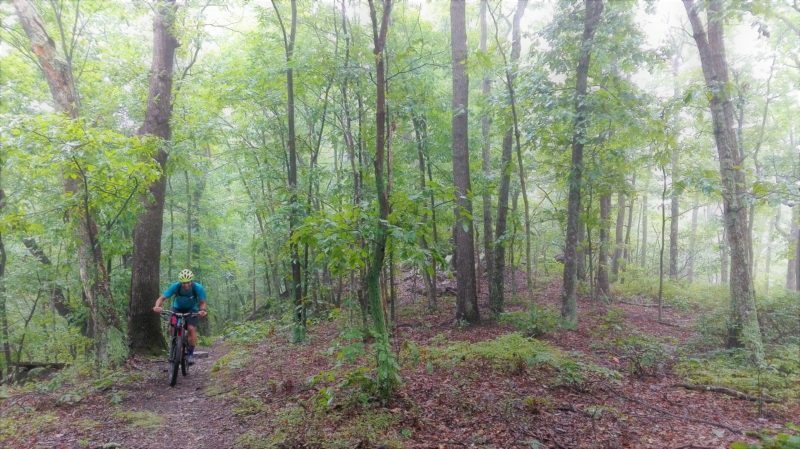 A singletrack masterpiece riding from Harrisonburg (Rock Town) to Roanoke (Star City). He designed it as a race, with three options; the insanely difficult singletrack route, the very very difficult gravel route and the still very difficult paved route. I wish I knew about it on my way here and I would have used it to get to Roanoke! Hurricane Florence stalled on the coast and isn’t looking to hit West Virginia for another two days. We (me and the family who are hosting me) pick up supplies and start to make ready for a possible flooding situation. Lisa, Rob’s wife is battling to keep Rob focussed on weather proofing the house. It’s hilarious to witness, she asks him to clean the gutters but we get distracted going for a night ride. The next day we go out for a ‘quick bike ride’ (the Dragons Back) before we get to the gutters. We return 5 hours later, muddy and tired and soaking wet. We do finally, get to the gutters but only on the day the hurricane is predicted to hit. Lisa is well aware of this and laughs away and even encourages our many distractions. She was filming some of the shenanigans on the CX course around their house. 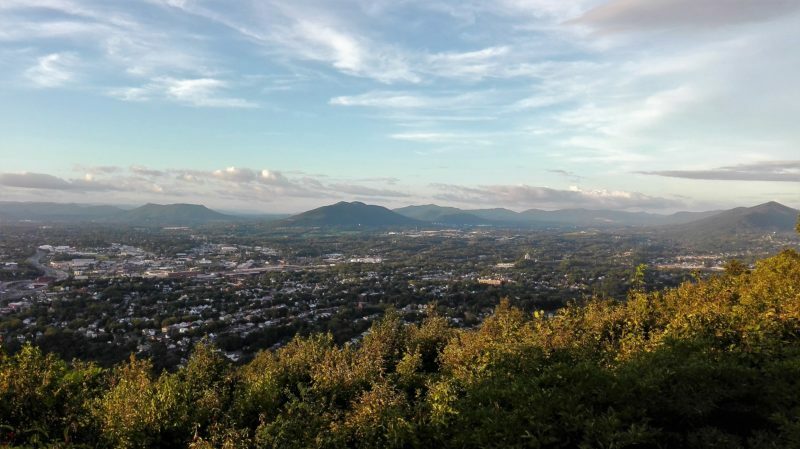 My first full day in Roanoke was basically a rest day. I was exhausted from the last week of riding. The stress of racing against the storm plus the brutal hardship of the VMBT had wiped me out. So, I spent my time fixing up my bike and eating plenty of fruit and trying to do as little as possible to help my recovery. That last until about midday when Rob invited me out for the Roanoke Night Ride. A chance to ride some of the amazing trails in the area and meet the biking scene here! How I could I resist that! We meet outside Rob’s local bike shop. Night rides are very similar no matter where in the world you are. They attract the very passionate rider and the mildly obsessed. I love that I get to geek out over bikes with other like-minded individuals. There is a ragged bunch of maybe 20 guys of varying ages and shapes but all sporting giant quads and calves. It’s a real mixed bag and I am welcomed right in. A quick perusal of my bike and we have a chat on gearing choices and tyre width and I am one of the gang. We head out for the ride, I am in the front third just enjoying a casual look around the town. I am chatting to a wiry South African and an American policeman both riding singlespeeds and still beating me up the hills. We make the trail head and I get my first glimpse of the quality of the riding in Roanoke, I am blown away. The local trails are epic and plentiful. We climb a beautifully crafted track meandering through the woods. Steep enough to raise the pulse but comfortable enough to enjoy and chat at the same time. Our group seems to be growing as we ride more and more people emerge from various trail heads laughing and joking as they join the stream of riders filing up the hill. A short but very fast descent has me catching back up to the South African who left me for dust on the uphill. As I ease off the brakes on a straighter section, I spot a deer bounding through the woods to my left. Bouncing parallel to me, easily keeping pace. I watch in my periphery worried that it will try and cut ahead but it turns last minute and leaps deeper into the forest. 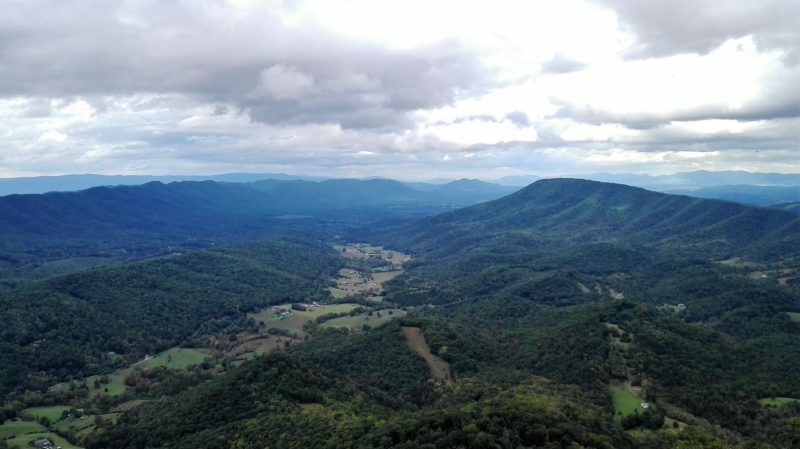 I am amazed, we are still in the center of Roanoke but the forest seems as wild as the remote mountain range that borders the city. By the time we reach the top of the hill our numbers have swelled to maybe 30 sweaty, smiling riders, a few look a little dirty from a slip or spill on the way up but everyone is super happy to be out and riding. I notice no one seems particularly worried about the approaching hurricane either. Perhaps they are just more used to hurricanes than me. We descend a slightly harder route but even in the failing light its really fun long fast descents skirting the edge of the hill, a steep drop to one side but really entertaining. I push it as fast as I dare. Very aware that I still have a lot of riding to do after Roanoke. Day two in Roanoke and Rob want to show me a part of the Rockstar Route. We abandon the hurricane prep and head out the edge of town. The track is a thin strip of soil, jutting up into the forest line from the side of the road. It’s brutal steep right from the get go as we fight gravity to get up to the ridge line. Jagged switchbacks closely coiled like a compressed spring shoot us vertically through the forest. I can’t believe the humidity though. The only saving grace is that Rob is struggling too. He rides in Virginia for years and still is pouring sweat. We make it on to the ridge line and I see the familiar logo of the Appalachian Trail. This used to be a part of the route until it was moved to the next ridge over. Making a perfect place to make a mountain bike route in its stead. The scenery is like the Tuscarora Trail I’m having panicked flashbacks! Why would I do this to myself again? But the trail is maintained and super fun. The ground is still scattered with small boulders and off-camber roots but they are visible at least. I can pick a route instead of wading through deep grass and overgrown bush. Once on the ridge line to trail undulates up spearing peaks and down little flowy chutes. It is technical uphill riding, jagged rock gardens where every half turn of the crank has to be carefully planned and executed. Clearly, I struggle, pushing some sections and forcing other sections with more brute force than finesse. Tyres sliding wildly on slick rocks and catching last minute jarring me forward inch by inch. It’s more like trials riding than trail riding. Rob is smashing it though, clearing sections and even going back to sections where he ‘dabbed’ (put a foot down) I’m starting to see the usefulness of being clipped in but at the same time I don’t like the commitment in the case of a fall. Mist rolls through the trees, a norm that I am becoming accustomed too. Visibility is about 100m still and I feel much more comfortable riding with someone as opposed to solo. My bike feels feather light without all my camping supplies too. Its making for a great day. 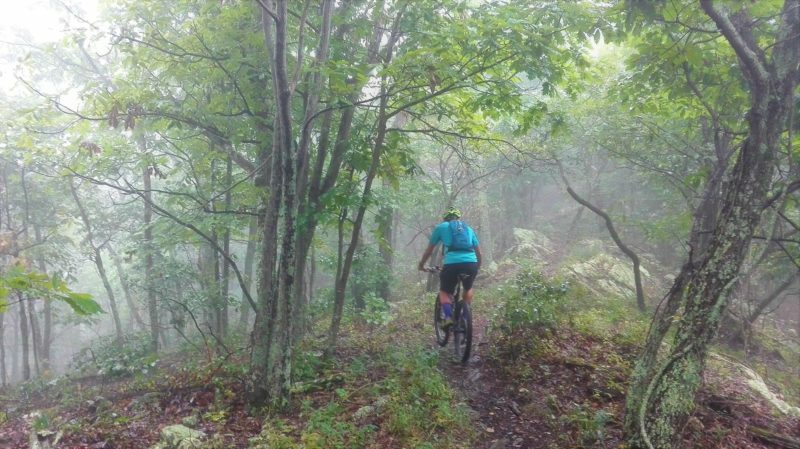 Epic trails, fun company and it is barely raining. By the time we make the end of the ridge we are seeing multiple trails breaking off in random directions. It’s getting on in the day and I think rob sees that I am starting to get tired. We head downhill. It’s an epic section of tight singletrack. And I mean tight! My knuckles snag and tear on bushes encroaching onto the trail, every switchback I haul right over the back wheel and slide my weight into the hill, peering over my inside shoulder to draw my bike around the tight turns, then its brakes off and bounce down the narrow line between trees. Diving onto the brakes again for another opposite switchback. Praying the front wheel holds the line as it rolls centimeters from a steep drop down the hillside. We make the fire roads and we are still a few valleys over from the car. My legs feel fine but I am certainly starting to bonk. But I am enjoying sharing the riding with someone else and we chat as we crank up hills in our lowest gear. Winding along gravel backroads wiping cobwebs from our faces as we go. Rob is stoked to be able to take me out and show me all the singletrack in the area, most of his guest are touring cyclists riding the Blue Ridge Parkway, so it’s a nice change to go mountain biking. After four days in Roanoke, the hurricane is finally due to hit. We eventually got around to waterproofing the basement and clearing the gutters, after two bike rides and a hike. We were prepared and had our survival kit set. Just in case. 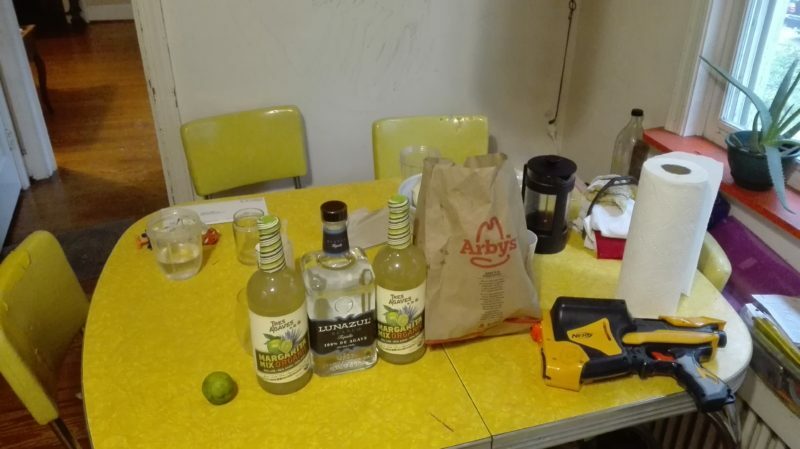 Margaritas and Arby’s. We were ready for whatever was going to hit. During the night the temp dropped and it started t rain it was admittedly a pretty heavy rain but nothing compared to some of the storms I see in Milford Sound. It continued to pour throughout the night. The next morning the humidity had lifted and that was it. Hurricane Florence went from a Category 5 Hurricane to a tropical storm. When it hit land, it did wreak chaos and destruction but by the time it got to us it had worn itself out. To celebrate the whole family and I went for a hike. Where else but the Appalachian Trail. 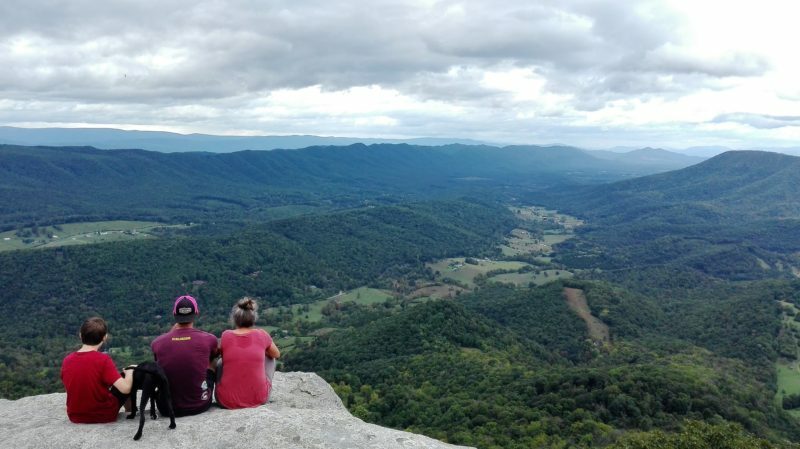 We hiked to Mcaffey Knob one of the most photographed sections of the whole trail. And I can see why. It’s a sunny day, a few clouds scattered sheepishly around after the storm last night. Like the last people to leave a protest, once powerful in numbers now look meek and embarrassed as individuals. I looked out on a full panorama of the hills I had been and would be riding. One of very few views I would get from within the ‘green tunnel’. I could see why it’s called the Blue Ridge. After a very extended stay in Roanoke I was sad to leave the family, the fun and games of watching the parents wind up the children was a nice surprise. I was made to feel right at home and was loving chatting to Lisa in the mornings and riding with Rob in the afternoons. But the trail called, and with the storm passed it was time for me to continue. Rob put me back onto a new track. 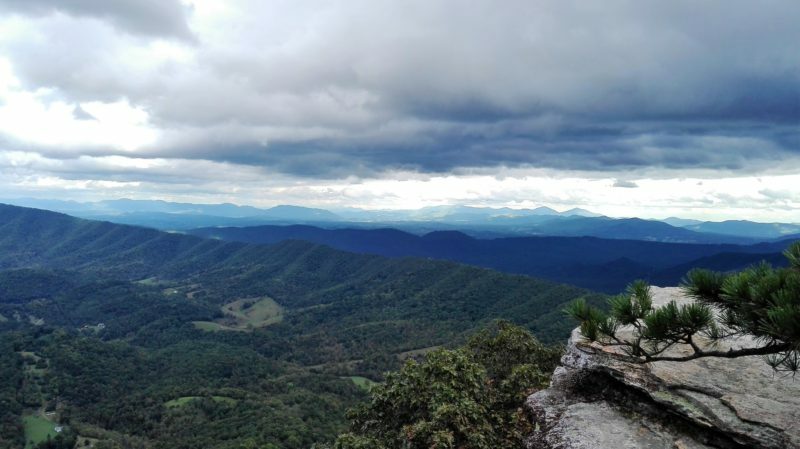 The TransVirginia, created by David Landis (shout out for making an amazing trail!) a gravel trail snaking through the Appalachians over to Damascus where I could join the Trans West North Carolina Trail and continue the Southern Highlands Traverse.